Nellis Air Force Base (IATA: LSV, ICAO: KLSV, FAA LID: LSV) is a United States Air Force base located in Clark County, Nevada. It is seven nautical miles (13 km) northeast of the central business district of Las Vegas. Nellis hosts air combat exercises such as Red Flag and close air support exercises such as Green Flag flown in "Military Operations Area (MOA) airspace", associated with the nearby Nevada Test and Training Range (NTTR). The Nellis AFB mission of advanced combat training for composite strike forces is commonly conducted in conjunction with air and ground units. In FlightGear, it's home of the Operation Red Flag (also known as OPRF) crew which is a community of pilots who share the interest of military aviation and related topics that trains regularly in the surrounding area and organize monthly big events focused on realistic military operations. Nellis Air Force Base was named on 30 April 1950, and the 20 May 1950 dedication was attended by Lieutenant Nellis' family. By 1 July the Air Force had directed ATC to accelerate Korean War training for a new 95-wing Air Force. The first school opened at Nellis, and ATC redesignated the 3595th Pilot Training Wing (Advanced Single-Engine) as the 3595th Training Wing (Combat Crew). On 17 July 1950, Nellis began a replacement pilot training program to provide 115 FEAF F-51 Mustang pilots and 92 combat-ready F-80 Shooting Star pilots. Nellis' advanced single-engine pilot training transferred to Alabama on 1 September 1950. Nellis assumed fighter-bomber training, and ATC established its USAF Air Crew School (Fighter) on 14 November 1950, equipped with F-80s and early-model F-84C Thunderjets. On 1 October, Nellis AFB base management functions transferred from Williams AFB. In early 1951, ATC assigned recently graduated airplane and engine mechanics to Nellis to learn jet aircraft maintenance. The airfield was expanded 1951-4 with longer jet-capable runways, reconfigured taxiways and a larger aircraft parking ramp; and WWII wooden structures were replaced with concrete and steel structures (e.g., barracks and base housing for married personnel). The first Wherry houses were completed in 1954, with updated Capehart houses being completed in February 1960. Nellis AFB transferred to Tactical Air Command on 1 February 1958, and the Nellis mission transitioned from initial aircraft qualification and gunnery training to advanced, graduate-level weapons training. The USAF Tactical Fighter Weapons Center was activated on 1 January 1966 (USAF Warfare Center after 15 Nov 2005) and has developed, refined, coordinated, validated and tested fighter concepts, doctrine, tactics, and procedures. The 57th Fighter Weapons Wing (activated Oct. 15 1969) trained tactical fighter aircrews, conducted operational tests and evaluations, demonstrated tactical fighter weapon systems, and developed fighter tactics. The USAF Air Demonstration Squadron (the "Thunderbirds") was assigned to the 57th in February 1974. Current Nellis layout include a major surrounding area of the air base with custom buildings available in TerraSync. 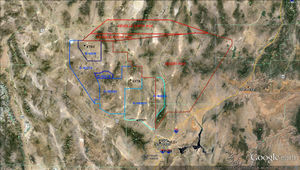 Picture explaining the Nevada Test and Training Range areas. Currently, a service of constant air patrol is offered by members of the OPRF crew to respect the NOTAM of the Nevada Test and Training Range, which is daily used by its members for air operations such as air combat training, flight testing and simulated missions. 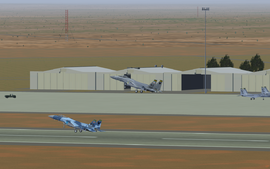 In addition to Nellis and Homey Airport (commonly know as Area 51), J Maverick 16 provided a custom scenery update for the air bases included in the NTTR which are Creech AFB (KINS), Tonopah Test Range Airport (KTNX) and NAS Fallon (KNFL) home of the Naval Fighter Weapons School (TOPGUN), including also updates on KLSV. A download link of the current work can be found at the bottom of the page. As of June 2018, overall 3D improvements have been released through TerraSync at Nellis, including the above-stated custom scenery work too. This page was last modified on 25 June 2018, at 10:17.